I’ve been curious about why canoes do what they do for some time. And in training for downriver and flatwater races I have also become curious as to why my body does what it does. In particular, why am I training in any particular way? The common wisdom is that one needs to do overdistance paddling, intervals, and (maybe) tempo work to prepare for racing season. But… Why? Why not just go out for a pint and be done with it? What goes on inside your body when you train or race? And does this relate in any way to how you (should) train? It turns out that your working muscles are fueled by three distinct metabolic energy systems (sometimes called “pathways”): the aerobic system, the anaerobic or lactate system, and the phosphate system. Each plays a role corresponding to the intensity and duration of your paddling. The efficiency of these systems helps determine your paddling endurance capacity. The following overview of these controlling metabolic systems will provide background and context for the “curious paddler” who wonders how and why the body performs and adapts to training. And don’t worry. You needn’t to be an exercise physiologist or biologist to read on; I’m not! The aerobic system, also called the “oxygen” system, utilizes fats (in particular, triglycerides) and sugar (in particular, glycogen) to fuel your muscles. It does so by producing a compound called adenosine triphosphate (ATP). ATP fuels muscle contractions, as will be explained below. The aerobic system is idealized in Figure 1. While this figure may look like biochemistry gobbledygook, consider that it summarizes much of what happens in our muscles when we paddle. We noted that there are two raw fuel sources for the aerobic system: fats and sugars. Your body stores fats from your diet in the form of triglycerides. These are processed during exercise in several intermediate steps. In the first step triglycerides are combined with water to yield fatty acids and glycerol, as shown in the Figure. The fatty acids are then processed in the muscles via a process called beta oxidation. Carbohydrates in the form of glycogen, a long-chain sugar molecule, are stored in the liver and muscles. During exercise glycogen is processed in the muscles via a process called glycolysis to produce ATP. This ATP may be used directly by the muscles; glycolysis is a fast reaction compared to beta oxidation. Note that the glycerol released during fatty acid production is also processed to produce ATP via glycolysis as shown in the Figure. Both beta oxidation and glycolysis produce intermediate compounds that are necessary for muscle metabolism. These compounds enter structures within the muscles’ cells called mitochondria. Mitochondria function as “engines” that produce ATP at the cellular level through a combination of the Krebs Cycle and the Electron Transport System. In the electron transport system the muscle metabolism byproduct adenosine diphosphate (ADP) is combined with phosphorous to produce the muscle contraction compound ATP. As Figure 1 indicates, the aerobic system is where oxygen is “burned,” combining with free hydrogen ions to produce water as shown in the lower right hand corner of the block diagram. The muscles are continuously processing ATP to release energy for muscle contractions. This energy is produced when a phosphorous atom is released from ATP (the “tri”-phosphate), producing ADP (the “di”-phosphate). The precursor compound ADP is always present in the muscles, waiting to be recycled in the electron transport system to produce ATP. All that is required is fuel, either in the form of fats or carbohydrates, to be processed through the linked pathways of beta oxidation, glycolysis, and the combining Krebs cycle. Now as with any oxidative process there are byproducts, just as your car produces emissions. The byproducts of muscle respiration, carbon dioxide (CO2) and water (H2O), are removed by the lungs and carried through the bloodstream, respectively. Figure 1: Combined energy pathways. The store of carbohydrates in the body that fuel glycolysis is limited, whereas the store of fats to feed beta oxidation is comparatively unlimited, no matter how lean you are. The “fat” and “glucose” systems work simultaneously, but their contributions to the energy supply are different, and depend greatly on your level of exertion as well as how you train. Fats are metabolized primarily during low-intensity exercise. For example, as you sit and read this article your body is mainly burning fat as its energy source. As exercise intensity increases, carbohydrate oxidation via glycolysis becomes the dominant energy source, as idealized in Figure 2. The body can store enough carbohydrate in the muscles and the liver to provide about 90 minutes of energy for exercise by glycolysis alone. When your carbohydrate stores are depleted, fat burning increases and the ability to sustain your level of effort decreases – fat oxidation always requires a small amount of carbohydrate to “keep the fires lit.” That is why a marathoner can “hit the wall” at around the 90-minute mark unless they replenish their glycogen stores during the race. Glycolysis can be prolonged by drinking carbohydrate drinks and eating modest amounts of easily-digestible high-carbohydrate foods during long-duration training and racing. 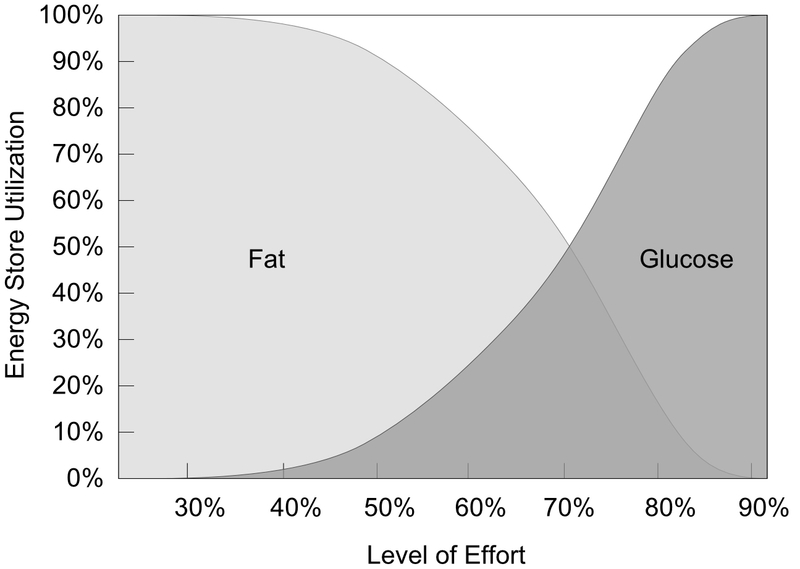 Figure 2: Aerobic fat and glucose utilization during steady exercise. What is of particular interest is that through exercise you can train the muscles’ metabolic systems to use energy more economically. With appropriate training the number and density of mitochondria in the muscles increase, providing more “engines” to burn fat and glucose. The metabolic pathways become more efficient as well; a well-trained athlete can oxidize fat for a longer time, shifting the curves in Figure 2 to the right, and thus save (some) glycogen for high-intensity efforts like jumping wakes and finishing sprints. In addition to metabolic adaptations, aerobic exercise will increase the number and density of the tiny blood vessels within the muscles called capillaries. This change can be seen under a microscope after the first few weeks of aerobic training – just don’t try this at home! As a result, the heart will be able to supply more oxygen-rich blood to the muscles, and more efficiently remove the chemical by-products of exercise including carbon dioxide, water, lactic acid, and free hydrogen ions. A long-term program of aerobic exercise will also increase the heart’s strength and stroke volume. Consequently, the well-trained heart can pump more blood with each beat, with a corresponding lower heart rate for the same level of effort, and a lower resting heart rate. As you begin to exercise, it takes about 2 to 3 minutes before the heart, lungs, and circulatory system fully function, and for the aerobic system to be fully engaged. This is one reason why you need to warm up prior to training or racing. It takes as long as 48 hours to replenish glycogen stores in the liver after long, strenuous exercise. Muscle glycogen, however, can be replenished in a few hours. Consequently, long over-distance workouts (approximately 2 hours or longer) should be followed by a recovery day of light exercise, or a strength-training day. That said, many ultra-long distance racers will perform “sandwich” aerobic workouts on consecutive days, say three hours one day and five hours the next, to acclimate the body to partial recovery and how it feels during very long races like the Clinton or the AuSable. Aerobic energy is synonymous with oxygen uptake capacity and mitochondria density. The body adapts to the stress of training over time, and will increase the number and density of aerobic muscle mitochondria from 3.5% of muscle mass to as much as 5% of muscle mass. Extensive aerobic training can increase aerobic endurance capacity by approximately 50%. This adaptation takes about 4 years to plateau. Sorry, but great endurance athletes aren’t created overnight! Increases in mitochondria number and density, and capillarization, occur in the muscles that are stressed in aerobic exercise. Consequently, to develop aerobic capacity for paddling, you should paddle. This phenomena is called training specificity. Running and cycling, for example, won’t by themselves enhance paddling aerobic fitness, but they will generically increase cardio-pulmonary efficiency. You are what you eat; you can best do what you train for. Glycolysis produces a metabolic byproduct called lactic acid, a feature we conveniently ignored when discussing Figure 1. Lactic acid is reprocessed in the liver via the Cori Cycle, producing glucose to fuel the muscles. The Cori Cycle is depicted conceptually in Figure 3. 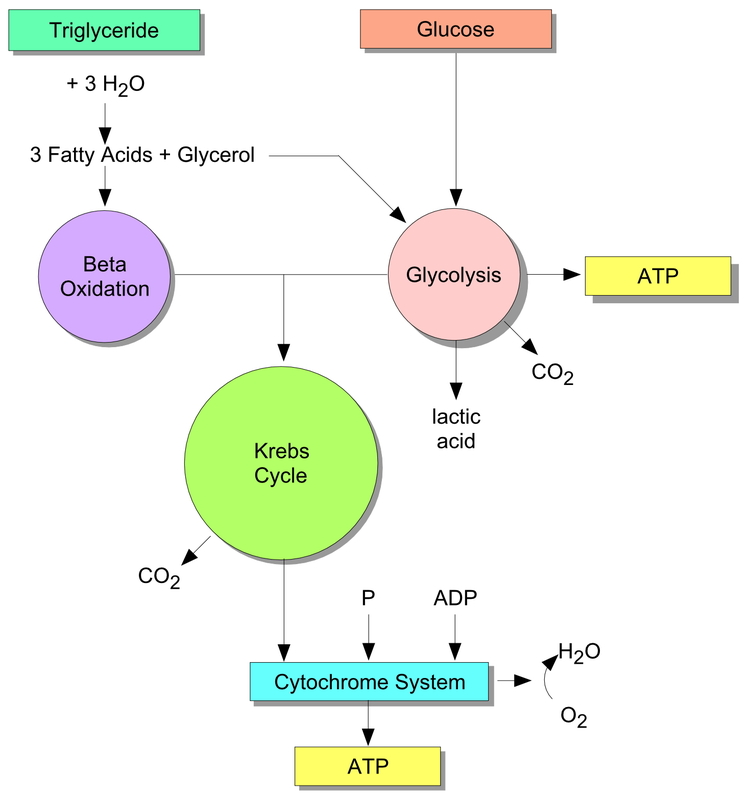 Glycolysis and the Cori cycle do not require oxygen to produce ATP to fuel muscle contractions, hence the Cori Cycle is “anaerobic,” or functioning without oxygen. Glycolysis and the Cori cycle produce ATP more quickly than the aerobic system, since the anaerobic pathway entails only about a dozen chemical reactions. Figure 3: The Cori Cycle. At the start of exercise, irrespective of its intensity, the energy supply is anaerobic, fueled first by the phosphate system (which we’ll discuss later), and then by the anaerobic system. For exercise lasting around 1 to 3 minutes, such as 400m and 800m runs, the energy supply is predominantly anaerobic– recall that it takes 2 to 3 minutes before the aerobic system “warms up” completely and provides ATP. The anaerobic system also supplies the energy during increases of pace (surges, finishing sprints) beyond the aerobic level in an otherwise aerobic paddling session. During steady-state exercise the Cori Cycle is always operating in the background, even at very low levels of exercise intensity. It is important to note that the Cori Cycle can recycle lactic acid completely below a blood lactate concentration of around 4.0 millimoles per liter. Lactic acid is providing fuel for your working muscles. However, as the level of exertion increases this recycling process cannot keep up with lactic acid production. This lactate threshold occurs at a blood lactate concentration of approximately 4.0 millimoles per liter. As lactate concentration increases to around 7.0 millimoles per liter, beta oxidation (fat metabolism) essentially stops, and the muscles are increasingly fueled by recycling lactate into glucose via the Cori Cycle. At extremely high levels of exercise intensity blood lactate concentration can peak at approximately 25 millimoles per liter. Lactic acid production ultimately limits anaerobic power. Lactate accumulation increases muscle acidity; this state of muscle acidity is called acidosis. Acidosis damages the walls of the muscle cells, causing leakage through the cell wall into the blood. Acidosis also interferes with and damages the system of aerobic enzymes within the cells, which decreases aerobic endurance capacity. And to add insult to injury, muscle contractions at very high lactate concentrations become more difficult because of a lack of ATP. Anyone who has done an all-out 400-meter finishing sprint will be familiar with this state; it feels like a bear has jumped on your back at about the 300-meter mark. With increasing acidosis an enzyme produced by glycolysis blocks lactic acid production. If not for this enzyme, further increases in muscle acidity would damage muscle protein and mitochondria. Consequently, the body does not learn to “tolerate” high lactic acid production; instead lactic acid production is self-limited. What the body must learn to do is adapt itself so that you can train and compete within tolerable lactate levels, e.g. increase the level of exercise intensity where your body is still able to recycle lactic acid. This level of exercise intensity is called the lactate threshold, and ultimately is the determinant of race performance. After hard anaerobic exercise it can take days before the body recovers sufficiently to regain full aerobic capacity. When exercise is repeatedly too intense, e.g. without sufficient recovery between bouts of hard anaerobic exercise, aerobic and anaerobic endurance capacity decrease considerably, leading to a number of problems referred to collectively as overtraining. Recovery time, from 24 hours to as much as 96 hours, must be provided after hard anaerobic workouts before muscle cells normalize. This should be taken into account when developing a training program that includes anaerobic intervals, high intensity “threshold” exercise or tempo training, or racing. When the body is at rest it takes about 25 minutes to remove half the accumulated blood lactate that results from maximum exertion. 95% of lactate is removed after about 1 hour and 15 minutes of rest. Lactate is removed from the blood and muscles much more quickly when you perform light, continuous exercise at the end of a workout, rather than complete rest. This “active recovery” is best for your cool-down following a race or hard workout. A cool-down of light paddling will remove 90% of blood lactate in approximately 20 minutes. Yeah, that’s a long cool down, but at least 5 minutes if not 10 should be possible. It is a common assumption that lactic acid is responsible for increased recovery times after intense workouts. However, free hydrogen ions and other byproducts of anaerobic exercise also delay recovery. The phosphate system supplies energy directly to the muscles, and is fed by the aerobic and anaerobic pathways as described above. By itself the phosphate system also drives fast, powerful muscle contractions. The phosphate system does not use oxygen. This is fortunate, since very intensely contracting muscles squeeze off their own (oxygen-rich) capillary blood supplies. The phosphate system does not use glucose, or produce lactic acid, hence it supplies anaerobic alactic energy. It is the fastest muscle energy pathway because it requires the fewest chemical reactions. ATP –> ADP + energy. Prior to exercise the muscles themselves have a store of ATP that can be called upon for short bursts of maximum effort, up to approximately 3 seconds. The phosphate system then kicks in, and can provide energy for maximum effort for another 10 seconds, such as a sprinter would expend in a 100-meter dash. Thus, the phosphate system is of particular importance during short-duration sprints, race starts (hey; free energy! ), and while strength training. A compound called creatine phosphate (CP) provides the necessary phosphorous (P) to drive the phosphate system, re-synthesizing ATP in the muscles once their ATP stores are exhausted. The phosphate system replenishes 70% of ATP and CP within 30 seconds; these compounds are 100% replenished in 3 to 5 minutes. The phosphate system is trained by hard, short sprints, alternated with periods of complete rest. Think weight training if you’re lifting heavy – this relies solely on the phosphate system. Rest periods should be long enough for ATP and CP to re-synthesize. It is important to note that the replenishment of CP is delayed by high lactic acid concentrations. Thus, one should not combine anaerobic training sessions with pure sprint speed workouts. The muscles’ ATP and CP stores increase by 25% to 50% after several months of sprint training. However, the ultimate speed one can achieve in sprints is not limited by the store of ATP or the efficiency of its re-synthesis. Speed is also function of technique, and technique is determined by the central nervous system and your neuro-muscular pathways. The body employs all three energy systems described above during exercise. Yes, all of them. Their proportional engagement depends on the length and intensity of effort. The relationship between the duration of exercise and the percentage share of the various energy systems is conceptualized in Figure 4. 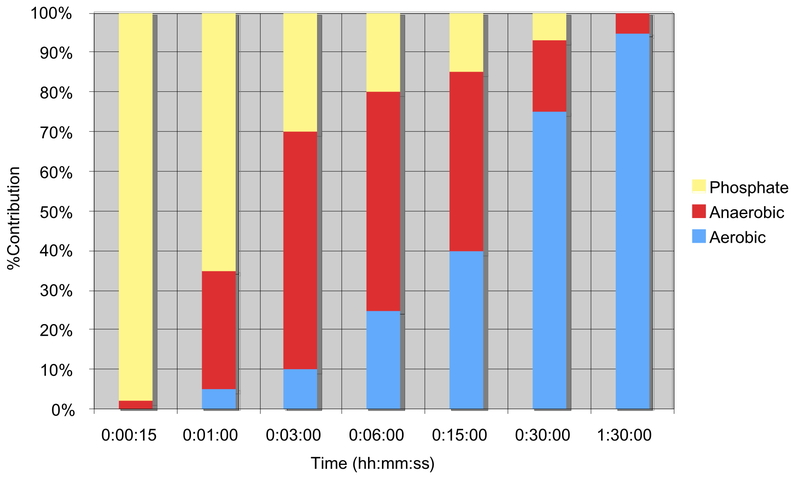 Note that each bar on the plot represents a maximum effort for the corresponding time interval on the bottom axis. As seen in the Figure, short sprints are anaerobic and alactic, primarily engaging the phosphate system. Assuming a complete warmup, a starting sprint will slightly engage the aerobic system. However, energy supply then is still dominated by phosphates and the anaerobic system. For longer races the aerobic system becomes the dominant source of energy. Figure 4: Energy utilization vs. time (after Janssen). This figure suggests that you should train each of the energy systems in proportion to how it is engaged for a goal race’s length. In other words, a paddler training for a long race should spend most of their training volume developing their aerobic system, especially to improve the efficiency of fat oxidation, and far less (but not zero) training their anaerobic system. For these paddlers, the phosphate system is far less relevant to train in isolation – except for starts. As the season progresses, and this paddler begins to train for shorter races, training can and should incorporate more anaerobic and sprint training as required by new goal race distances. Racers training for shorter events will already be doing so. And Figure 4 shows why. Anderson, Owen, “Periodization Training Technique: If you want to improve your performance, you can’t train the same way all the time,” http://www.pponline.co.uk/encyc/0147.htm. Bishop, D., Bonetti, D., & Dawson, B., “The effect of three different warm-up intensities on kayak ergometer performance.,” Medicine and Science in Sports and Exercise, Volume 33, pp. 1026-1032. Croston, Glenn, “Beta oxidation of fatty acids,”http://www.biocarta.com/pathfiles/betaoxidationPathway.asp. Croston, Glenn, “Feeder pathways for glycolysis,” http://www.biocarta.com/pathfiles/feederPathway.asp. Higdon, Hal, “Ultramarathon training,” http://www.halhigdon.com/ultramarathon/ultramarathon2000.htm, 2000. Isaka, T., & Takahashi, K. “Effects of off- and pre-season training on aerobic and anaerobic power of kayak paddlers,” Medicine and Science in Sports and Exercise, Volume 29, Number 5, Supplement abstract 1242, 1997. Maffetone, Philip, Training for Endurance, David Barimore Productions, Stamford NY, 1996. Noakes, Tim, Lore of Running, 4th Edition, Human Kinetics, Champaign, IL, 2003. Pfitzinger, Pete, “How to speed up recovery from racing,” http://www.copacabanarunners.net/i-recovery-racing.html, 2004. Pfitzinger, Pete, “Finding your optimal training / recover ratio, ”http://www.copacabanarunners.net/i-training-recovery.html, 2004. Schulman, Deborah, “Fuel on fat for the long run,” http://www.marathonguide.com/training/articles/MandBFuelOnFat.cfm, 2000. Szanto, Csabo, “Daily training program for advanced athletes, ”http://www.canoeicf.com/default.asp?Page=1605&MenuID=Development%2F1012%2F0. http://www.nismat.org/physcor/max_o2.html, “NISMAT Exercise Physiology Corner: Maximum Oxygen Consumption Primer,” 2005. This entry was posted in Exercise Physiology by Welos2. Bookmark the permalink.